From the article above: "The Oakville Art Society has taken possession of its new headquarters at 560 Bronte Rd., south of Speers Rd., last week. The society bought the building for $100,000 through Fred Schafer Real Estate Ltd., after deciding to vacate the Red House in Coronation Park. The deal closed on April 2, and renovations will begin soon at their new premises. 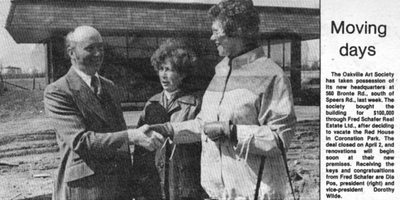 Receiving keys and congratulations from Fred Schafer are Dia Pos, president (right) and vice-president, Dorothy Wilde." With the Cottage unusable and the Red House to small for the group, OAS was in need of a new location. They soon found a home at 560 Bronte Rd. 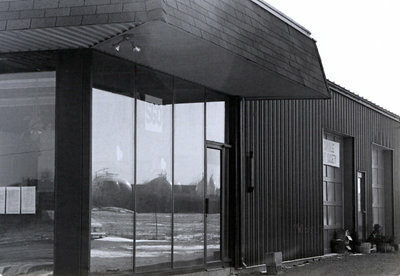 The building, once a boat shop, offered the space OAS needed for studios and a gallery. 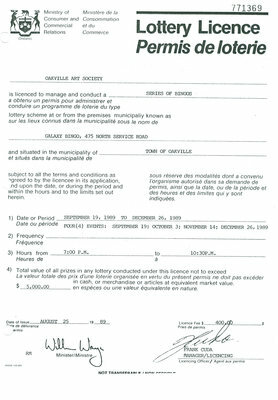 A mortgage was signed on April 2, 1980 for the property. The mortgage took a bit longer than expected to pay off but finally in 1990, to the relief of all, the mortgage was finally paid off. 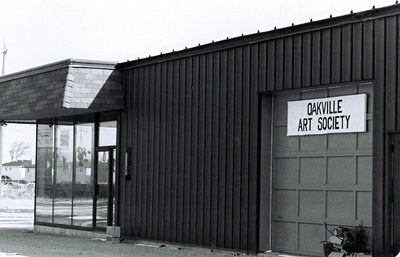 It seems appropriate that this marked the 25th anniversary of the Oakville Art Society. OAS was and still remains one of the few privately funded, not-for-profit, community organizations that own their own building. To help pay off the mortgage, OAS held several fundraisers and art auctions including bingo nights which required a license. In just one year the Oakville Art Society held 50 bingo nights in which they raised $ 21,426.00 to put towards the mortgage. The bingo nights were run by members and volunteers and would last for 3-3.5 hours. To offset the time commitment the OAS offered one free OAS class for every 10 bingo nights worked.